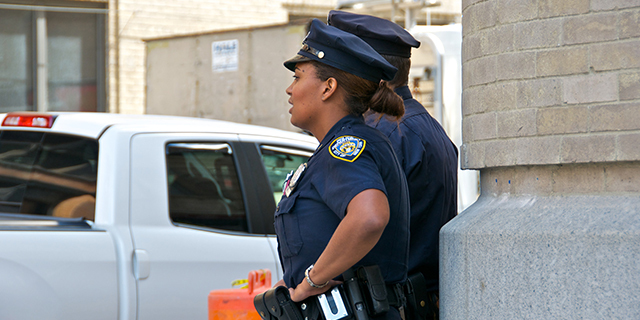 In recent decades, women have accounted for a growing share of America’s police officers, but this growth has been relatively slow and women remain underrepresented in the field. They also sometimes differ sharply from male officers in their views of policing and their experiences, according to a new Pew Research Center survey conducted by the National Police Research Platform. Women accounted for 12% of full-time local police officers in 2013 (the latest data available) – up from 8% in 1987, according to the Bureau of Justice Statistics. Women made up even smaller shares in department leadership: About one-in-ten supervisors or managers and just 3% of local police chiefs were women in 2013. The nationwide survey of 7,917 police officers in departments with at least 100 officers finds that many female officers think men in their department are treated better than women when it comes to assignments and promotions. About four-in-ten female officers (43%) say this is the case, compared with just 6% of male officers. 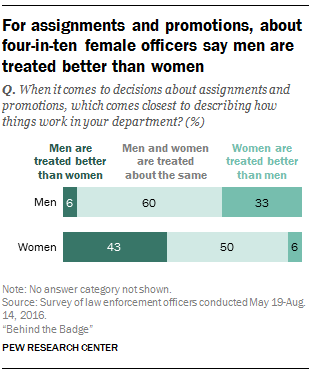 By contrast, a third of male officers say women are treated better than men when it comes to assignments and promotions in their department – but just 6% of women say this is the case. Six-in-ten male officers and half of female officers say men and women are treated about the same. When it comes to their experiences in the field, women are less likely than men to say they have physically struggled with a suspect who was resisting arrest in the past month (22% vs. 35% of male officers). Six-in-ten female officers say they have been verbally abused by a citizen while on duty in the past month, compared with 69% of men. These differences remain when looking only at officers currently on field assignments, such as a patrol officers and detectives. Most police (72%) say they have never fired their weapon while on duty outside of required training or on a gun range. Female officers are much less likely than male officers to report that they have ever fired their weapon while on duty – 11% of women vs. 30% of men. There is also a significant gender gap in attitudes on policing, with female officers less likely than their male counterparts to agree that aggressive tactics are sometimes necessary. Among female officers, 48% agree that it is more useful to be aggressive than to be courteous in certain parts of the city, compared with 58% of male officers. A third of female officers – but 46% of male officers – agree that some people can only be brought to reason the hard, physical way. At the same time, men and women share positive views of the citizens they serve. For example, about seven-in-ten male and female officers reject the notion that officers have reason to be distrustful of most citizens (72% and 70%, respectively). And similar shares say at least some of the people in the community where they work share their values and beliefs (70% of male officers and 73% of female officers). Male and female officers also report a similar range of emotions about the job. About six-in-ten male and female officers say their job always or often makes them feel proud (58% and 61%, respectively) and about half of male and female officers say they often feel frustrated (51% and 52%). But 57% of male officers say they have become more callous since taking their job, compared with 49% of female officers.